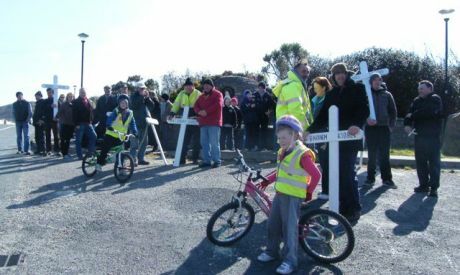 On Good Friday the community opposing Shell's Corrib gas project in county Mayo held the 8th annual Good Friday walk to remember the campaigners in Nigeria who were murdered for opposing Shell's destruction of their homeland in 1995. 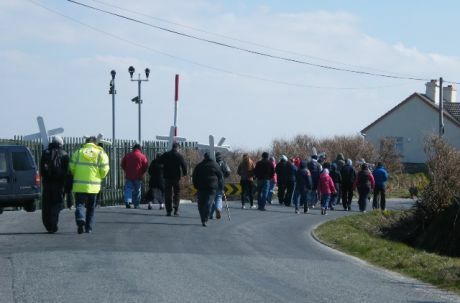 From midday people started to arrive at Glengad from all around the locality and from further afield. In Glengad Shell are currently building the Landfall Valve Installation (LVI), and a reception pit for the Tunnel Boring Machine (TBM). Shell have begun tunneling from the Aughoose compound but rumours abound that the TBM has been stuck for the last 5 weeks. Once the walking group had assembled we struck out towards Aughoose in the freezing wind but under beautiful sunshine. On each Good Friday we walk together bearing crosses inscribed with the names of the Ogoni Nine – nine campaigners murdered by the Nigerian military government in 1995 at the behest of Shell. The Nine were community organisers who were successfully building a mass movement of peaceful opposition to the environmental destruction of Ogoniland in Nigeria by the activities of oil companies – principally Shell. Ogoniland is an extremely rural part of Nigeria – full of Mangrove forests defined by the Niger delta. It was an area of unspoiled nature where the local Ogoni people had lived by simple farming and fishing in a clean environment. The area is also extremely rich in fossil resources – oil and gas. Shell began exploiting these resources in the 1950s, and the decades of oil spills, gas flaring and human rights violations since then has ruined the health and well being of the population in tandem with the destruction of their environment. The lesson from Nigeria was spelled out to us by on Ogoni woman who visited the area last year. She said that we were in a great position – they hadn't even begun processing yet and that we should stop them before they do. 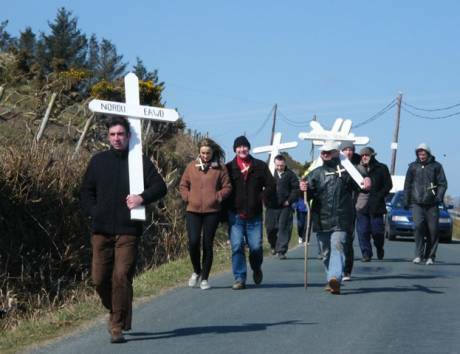 Since last year's walk Terrence had replaced the old crosses with new ones. They're pretty heavy though and they changed hands a few times over the 5km walk. The walk was a great chance to catch up for the old and new campaigners from all over. Spirits were high and the conversation was coloured with all the different rumours about the TBM being stuck. It was a sad occasion too as though we remembered those who were no longer with us in the flesh. We paused at the Pullathomas junction where Niall Harnett joined the walk last year, wishing that he rests in peace and continues to inspire us to act for justice. We were suprised when a lorry driver arrived while we were there and indicated to enter the compound. After a few minutes he got the message and left. Further on we came to the famous campaign trailer parked up in a lay by. It's great to see the trailer out as it was always a focal point of the campaign where news was swapped and actions dreamt up. Best of all was that the trailer came complete with Mary Horan serving up her famous scones and tea to feed the weary minds and bodies. 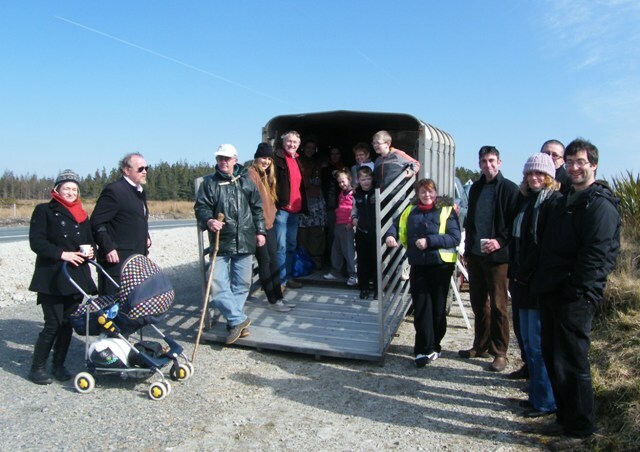 Over the weekend we got a few bits and bobs of the camp gear tidied up, and on Sunday one of the local farmers invited us over for Easter dinner. The Easter blessing he gave us was priceless - “That we may all be here again next year, and that Shell may have even more problems next year than they had this year.” - Amen to that! In the absence of a permanent camp at the moment, the next time that we're planning to meet up here is the last weekend in April to start preparing things for the June camp. 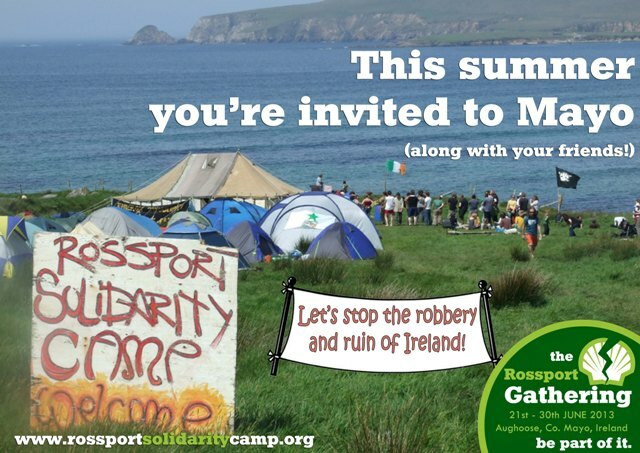 If you would like to come up that weekend to see what this is all about and give us a hand to get ready for the summer, email rossportsolidaritycamp@gmail.com so we can get an idea of numbers to plan accommodation and what we can get done.